What percentage of the Earth's land surface is covered by snow and ice? What is the difference between an Ice Age and a Glacial Period? When did the last Ice Age begin? 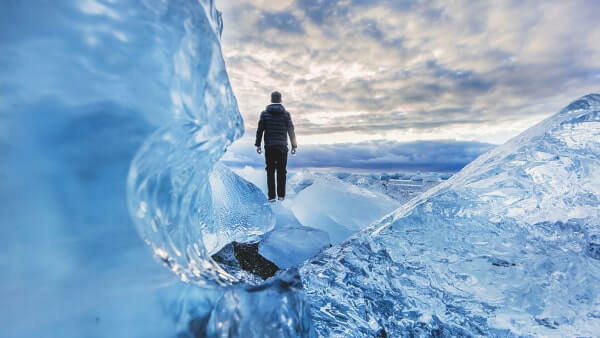 Geologically speaking, we are still in the latest Ice Age which began about 34 million years ago with the gradual formation of the Antarctic Ice Sheet and is known as the Late Cenozoic Ice Age. The Ice Age before this one ended about 260 million years ago and is known as the Late Paleozoic Ice Age (also known as the Karoo Ice Age). Another term for Ice Age is Glacial Period. The word glacial comes from the French glace which comes from the Latin glacia which means ice. When most people hear Ice Age they think of the time when woolly mammoths, sabre toothed tigers, Humans, and Neanderthals lived on a snow and ice covered Earth. It is true the Earth was colder and more of its surface was covered with snow and ice, but it was a period of increased glaciation1 in this current Ice Age. From a geological perspective, an Ice Age is any period when the Earth has at least one major permanent ice sheet.2 The total amount of ice coverage varies as the global temperatures rise and fall, but there is always at least one major ice sheet. Periods with more snow and ice covering the Earth’s surface are known as glacial periods and warmer periods with less snow and ice are known as interglacial periods. We are, currently, in an interglacial period known as the Holocene. Even though we live in a warmer period, there are still large glacial sheets in Antarctica and Greenland (containing about 99% of the worlds freshwater ice), along with numerous other glaciers around the world3 and sea ice in the Arctic. About 2.6 million years ago (the Pleistocene), the north pole began to cool resulting in the Greenland ice sheet and Polar Ice Cap. During this time, there were about 20 periods of glacial advance and retreat. At its maximum, about 30% of the Earth’s land surface was permanently covered in snow and ice. Currently, about 10% of the land surface is permanently covered in snow and ice (it rises to 30% during Winter). The most recent glaciation period ended about 11 thousand years ago. The most recent geological Ice Age has not yet ended. The previous geological Ice Age ended about 260 million years ago. An "Ice Age" is whenever there are permanent ice sheets on Earth. We are living in an Ice Age called the "Late Cenozoic Ice Age". It began about 34 million years ago. The Arctic Ice Cap and Greenland Ice Sheet began to form about 2.6 million years ago. This marked the beginning of the Pleistocene. During the last Glacial Period, about 30% of the Earth's land was permanently covered with snow and ice - today it is about 10%. Between 260 million years ago and 34 million years ago, there were no permanent ice sheets covering any part of the Earth's surface. We live in an interglacial period known as the Holocene.